Must be maximal effort, emphasis on tripple extention from ankles, knees and hips. Ensure players have a long contact time between jumps to ensure that there is correct joint alignment. 1. 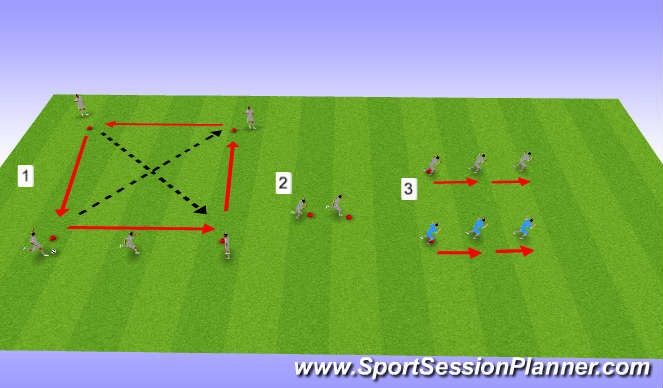 Passing drill 3x30seconds, players pass around the grid 30 seconds then perform 1 set of dynamics in rest period. players then pass diagonally for 3x30 seconds performing dynamics in rest period again (squat lunge matrix in rest period). Dynamics - Jockey, walkouts, open/close gate, kick throughs, high knees, heels to bum, low skips. 3. 2 footed jumps 4x6 (1:10) - Must be maximal effort, re-enforce long contact time but rapid triple extension. Progress onto single leg jumps again 2x6 (1.10).